The S&P 500 utility sector is up 2.5 percent in October, while every other sector is in the red and the broader index is down 4.4 percent. Investors usually rotate out of utility stocks when rates are rising, like they are now. The market appears to be prioritizing the utility sector's status as a safe haven during an October stock market slump. A view of the power lines as evening settles. If there is one market force powerful enough to boost utility stocks in rising rate environment, it appears to be the rush to safety in dark times. 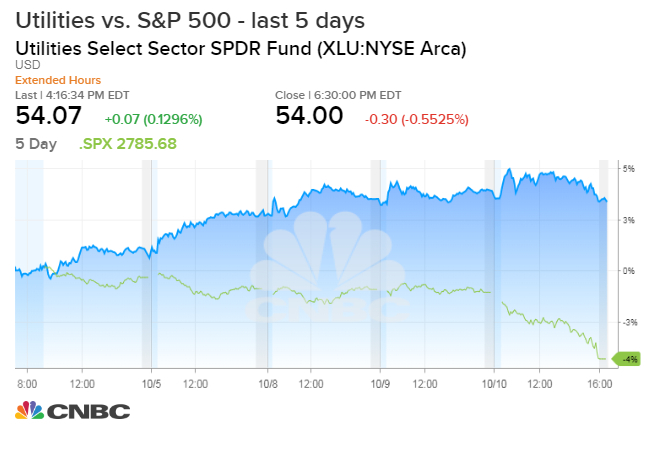 The recent rally in utility stocks — the sector is up nearly 4 percent over the last three months — got knocked off track as the U.S. 10-year Treasury yield began to march higher. A rising 10-year yield typically draws investors out of utility stocks, often called "bond proxies" for their bond-like qualities, including steady dividends and stability. But despite the 10-year yield sitting near a seven-year high, the S&P 500 utility sector has rallied from its September lows and is now up 2.5 percent in October. Meanwhile, every other sector is in the red and the broader S&P 500 is down 4.4-percent month to date. The October rout accelerated sharply on Wednesday, with the Dow Jones industrial average falling more than 800 points, or 3.2 percent, and the S&P 500 plunging by 3.3 percent. Given the stock market slump this month, investors are prioritizing another benefit of utility names: their status as a relatively safe haven. "In a market like this, in a dramatic sell-off, the rotational effects will be higher than the interest rate effect," said Jay Hatfield, portfolio manager at Infrastructure Capital Management. The utility sector saw the lightest losses on Wednesday, down just a half a percent, compared with the technology sector's 4.8 percent drop. Not everyone believes it's wise to hide out in utilities and other defensive sectors like REITs and consumer staples while the Federal Reserve is hiking interest rates. Art Hogan, chief market strategist at B. Riley FBR, told CNBC on Wednesday the group is "not safe at all in a rising interest rate environment." He advised investors who want to be defensive to raise cash rather than buy bond surrogates.